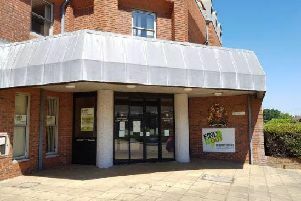 An application to preserve a mosaic and plaque affixed within the walls of Martlets Hall in Burgess Hill was approved, a spokesman for Mid Sussex District Council said. Burgess Hill Local History Society wished to take responsibility of the artefacts and requested a grant of £1,892 to reimburse the cost of removing, transporting and storing the mosaic and plaque with the intention of redisplaying the items at a future location yet to be determined. Its application, which was recommended for approval, was accepted at a cabinet grants meeting last Thursday. Martlets Hall closed on June 30, to allow for the redevelopment of the down centre by developer New River REIT. To support the process a sum of £250,000 was agreed by the developer to meet any reasonable costs for affected groups.